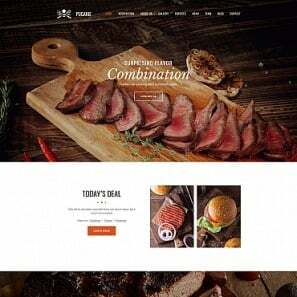 People spend hundreds of dollars to make a restaurant website and promote it online. 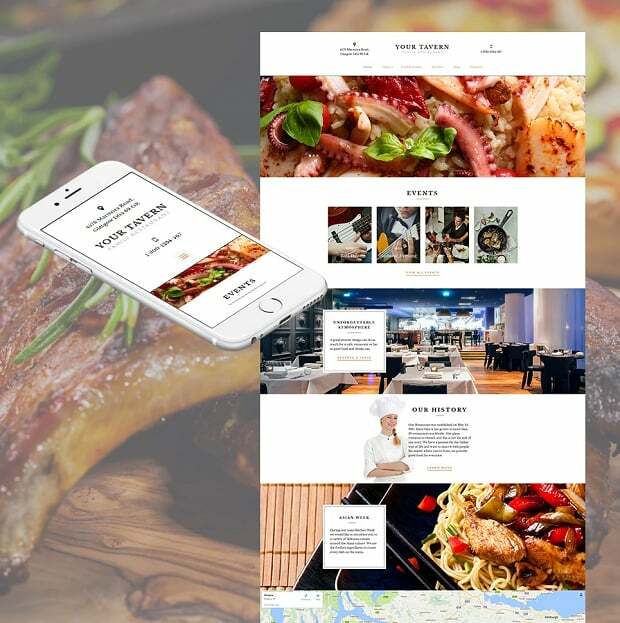 Some of the websites can amaze visitors, some can slightly evoke their interest, and some are able to bring real clients to the restaurant (that is actually the main purpose of the website). 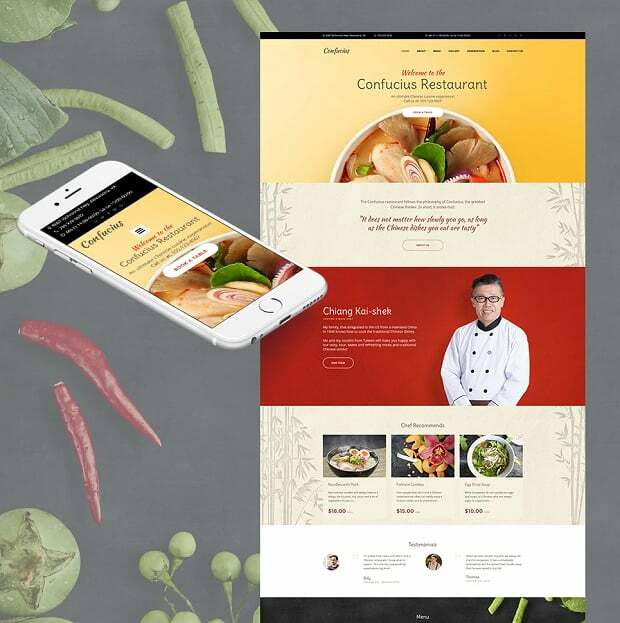 In this article, we will tell you how to create an effective cafe & restaurant website, which design elements are able to attract more visitors, and how to get people to willingly promote your food website for free. 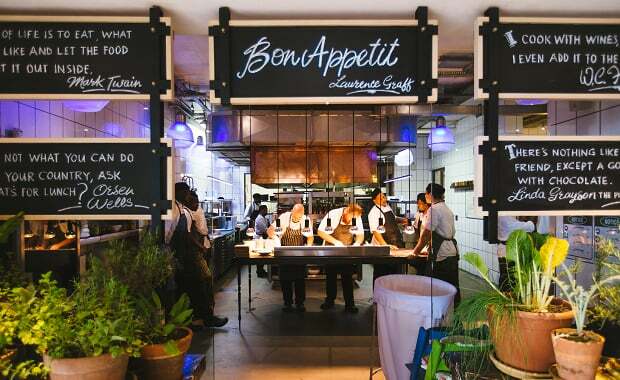 These tips are fine for different types of dining places: cafes, restaurants, bakery shops, coffee houses, tavernas, cocktail bars, steak houses, etc. 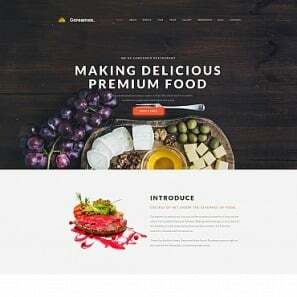 Beautiful restaurant website templates will come as a perfect example. 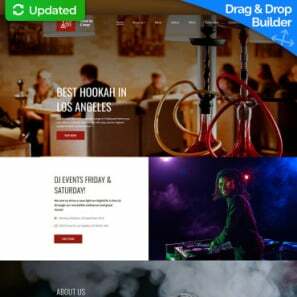 Create the atmosphere of your place right on your website. 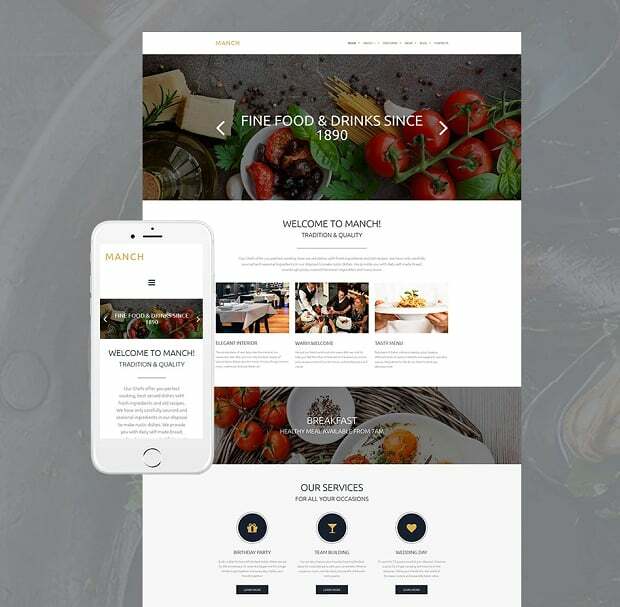 We will help you learn how to make a cafe & restaurant website and make it comfortable for your clients without any special skills in web programming. Take your own photos. This is the best solution you can make, but there are some conditions to meet. First of all, you have to find a photographer to carry out the task. Be aware of using images of bad quality. Blurred, badly re-sized and cropped, too dark or too light pictures look disgusting. At best people will be unpleasantly surprised, but more likely they will be disappointed with your site and leave it forever. Buy stock photos. 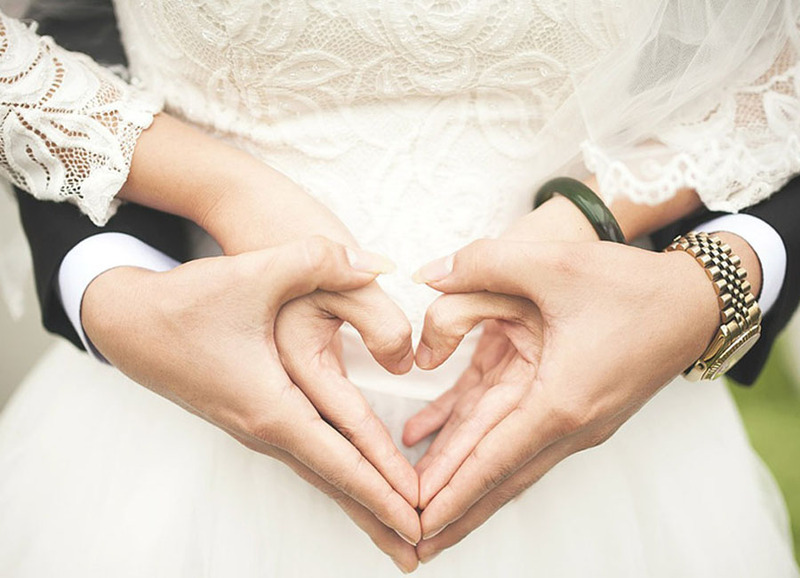 Thus you will save time on taking photos, retouching them and choosing the best ones. Stock images providers can offer you pictures and vector images of different resolutions, orientations, and categories. To draw more attention to specialty foods and beverages many cafes and restaurants illustrate their menus with photos. In this case, you should use stock images only if you’re 100% sure that your delicacies look just the same. Many of your clients will make orders by sight. People like the way something looks and they want to taste it. If their expectations mismatch the reality it will be the last time you see these clients in your dining place. 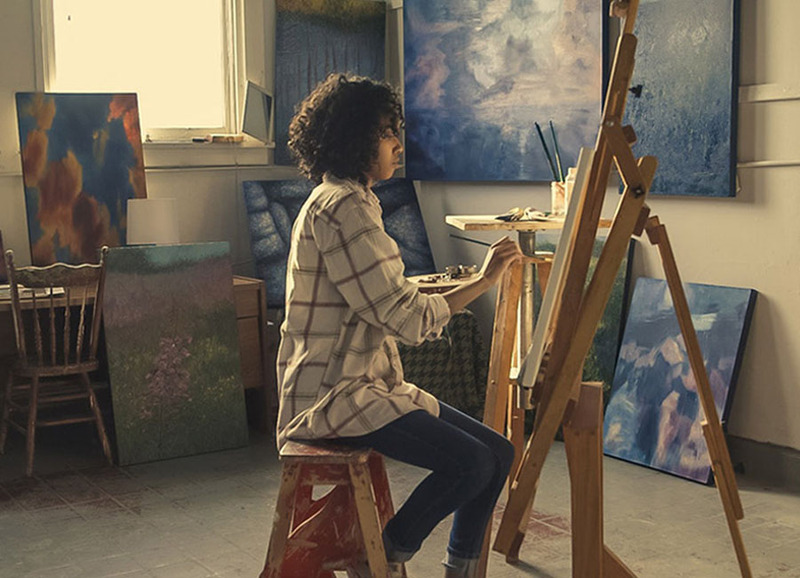 When you buy stock pictures you may also be tempted to save some money by choosing low-resolution images. Don’t be miser! In the short run you will save several dollars, but in the future, it can cost you a lot of money. 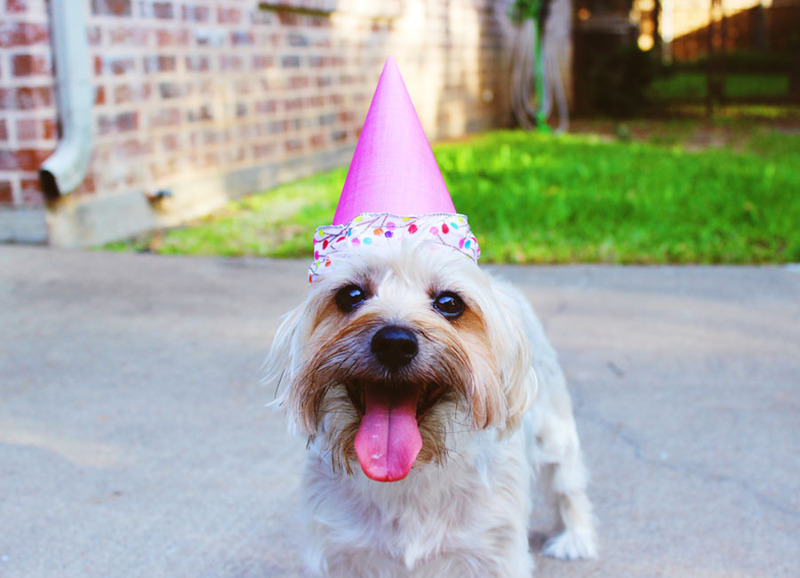 Find pictures within search engines results pages (SERP). That is one of the worst things you can do for your website. We beg you not to use images that search engines filter for you. The same goes with professional portfolio websites where photographers showcase their artworks (for example Flickr.com, 500px.com or 1x.com). All these pictures are protected with author rights. You can even get sued for using them. Now it is time to pay your attention to the main objects that make your images look more appetizing. Use photos of big plates served with less food then it normally would. The problem is that an overcrowded plate looks less fascinating than a small portion of food. Choose photos with a lot of white space of a plate. Such ‘frame’ will keep photos fresh and food colors will be more appetizing. Moreover, photos with white background easily match different website designs, so you’ll be able to re-design your project in future with the same pictures in use. Nutritious fruits and fresh vegetables salads with oil dressing. Pizza with a lot of cheese. It is scientifically proved that some colors influence people’s emotions and wishes. 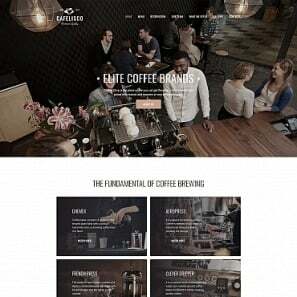 This observation can help you decorate your restaurant as well as its website. Such bright and warm colors as red, orange, yellow and magenta increase people’s appetite. They can also make some drinks more popular than others. Use image galleries. 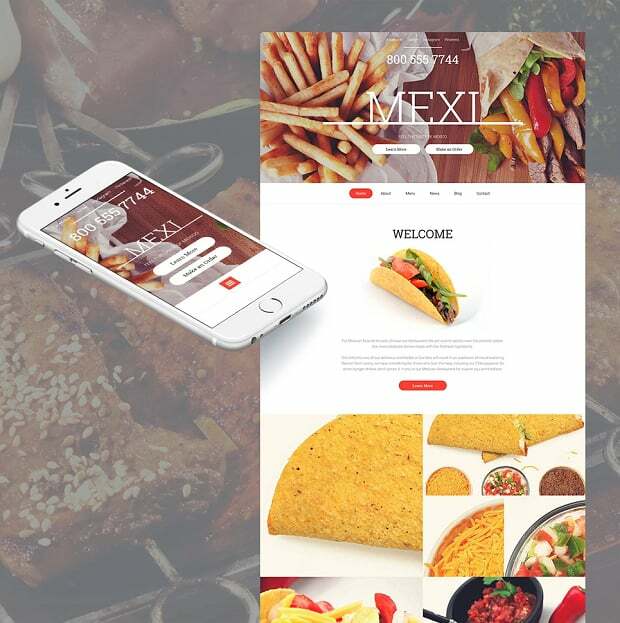 When entering your website people want to see what the cooking is like before visiting the restaurant. They want to see if the place suits them and which courses they will get there. So it is important to have an image gallery on a website. Do not use too many pictures. It is enough to showcase several photos of fancy food, interior, outdoor views, staff, etc. 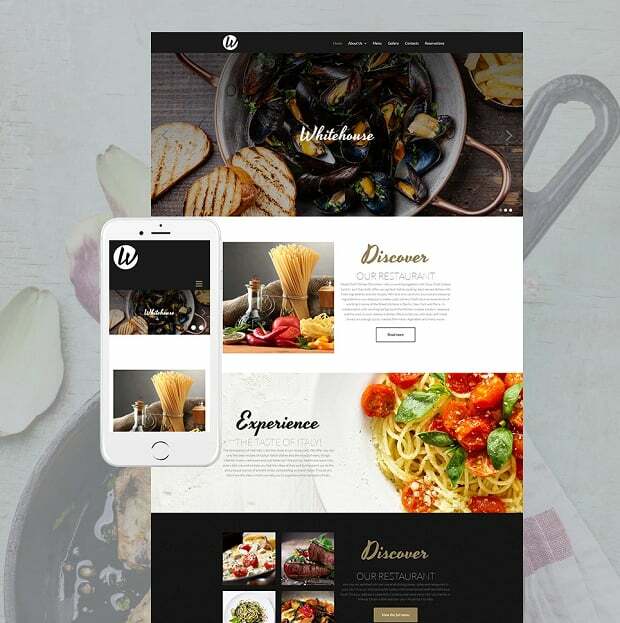 You can use the built-in functionality of your cafe & restaurant website template or set up an additional gallery plugin. Just don’t forget to re-size photos before uploading them. Rarely a website needs an image larger than 1000px in width. 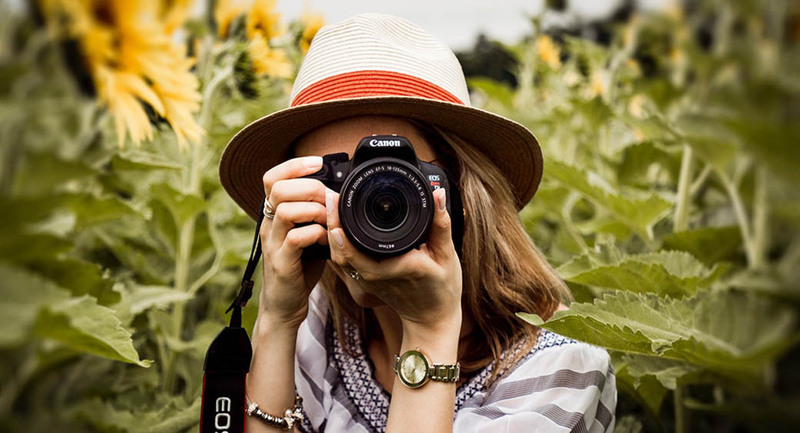 So if you use photos of a familiar professional photographer do not forget about this tip. 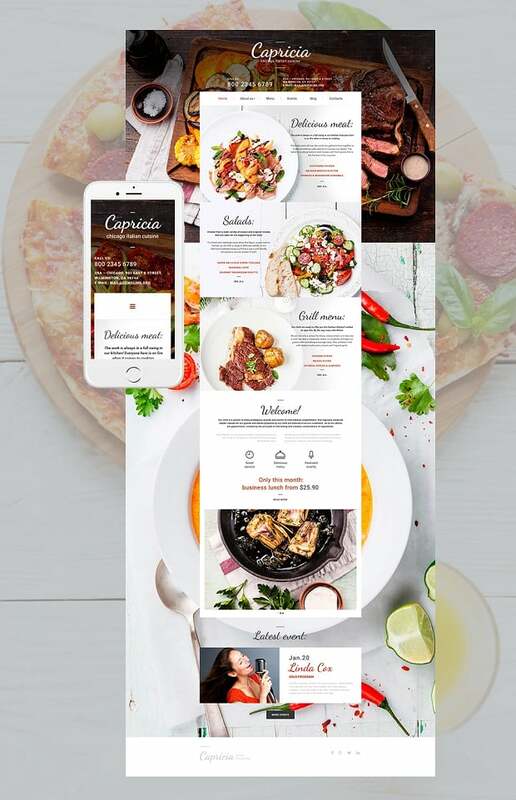 Put your restaurant menu directly on your website. Thus visitors will be able to glance over a menu at any time. When being placed on site, menus can be easily updated. Cafes and restaurants often create seasonal menus, vegetarian menus, and special holidays-related offers. These menus are offered just for a short period of time and then they can be changed or removed at all. 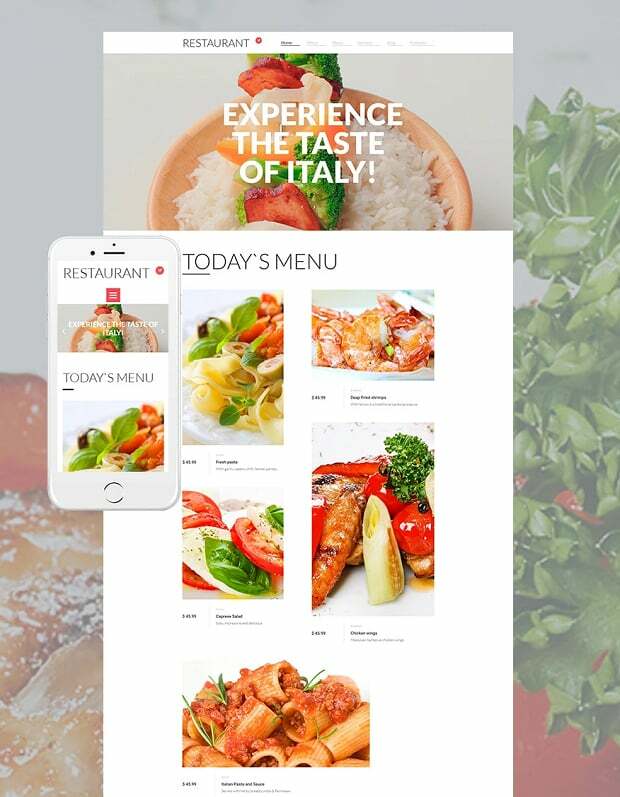 It happens that restaurant owners let site visitors download menus in PDF format. This solution is as convenient for web designers and developers as it is onerous for site visitors. People do not want to download anything. It makes them feel uncomfortable and it looks like you force them. Moreover, many people surf the web by using a mobile phone. This category of potential clients will never download your menu. They are afraid that these files will block up their devices. And they just don’t want to waste time. Catering websites work to get more clients to their places. Over the last years, these clients use mobile phones, smartphones, and tablets more often than computers. So if your website is not responsive/mobile-friendly you do not know how to run a business effectively. Very often when coming to another city in business people look for a dining place via their mobile device. 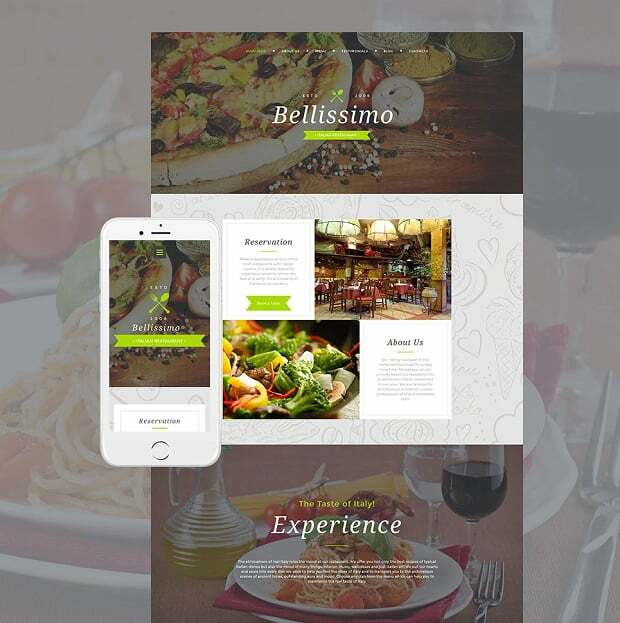 In this situation, restaurants with mobile-optimized websites will get new clients with no efforts. 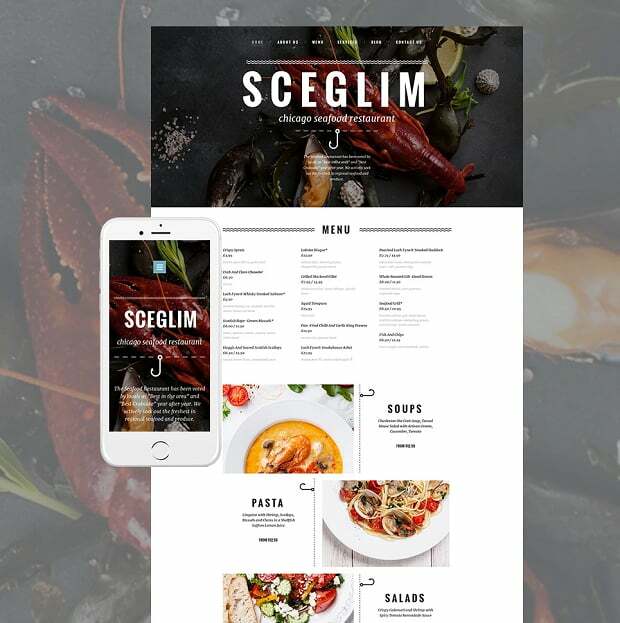 We have already mentioned that the main goals of restaurant websites are attracting new clients and engaging with current ones. It is impossible to do it without on-site contact info, location and hours. When we talk about contact info we mean postal address, phone/fax numbers, email, links to social media accounts. Without this information, people will not be able to find a restaurant. Much easier for them will find another dining place than search for other references on the web. It is considered to be a good idea to place the phone number at the top right corner within the entire website. Insert it as plain text (not image), so that users with mobile devices can make an immediate call. It can be not enough to let people know the postal address of a restaurant – not all citizens are familiar with the district it is placed in. Use Google Maps to show restaurant locations. It is clickable and people will be able to quickly find the shortest path to the restaurant. If you decide to have online reservation services you should make sure that all applications are taken into account in time by your staff. It can be a powerful customer care tool if it works without fails. You can create your own reservation system by adding and adjusting a contact form. On the web, you can also find ready-made online reservation systems. 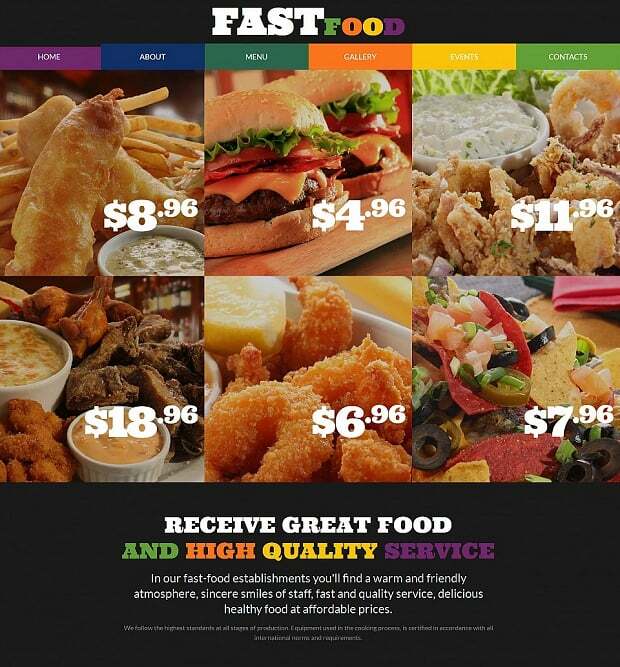 Online ordering is a great source of income, so if you do this service place its details and a plain view, for example on the home page. You may integrate any ready-made ordering system or let people know that you accept orders by phone. Just make sure that your call to action is well visible and clearly understandable. 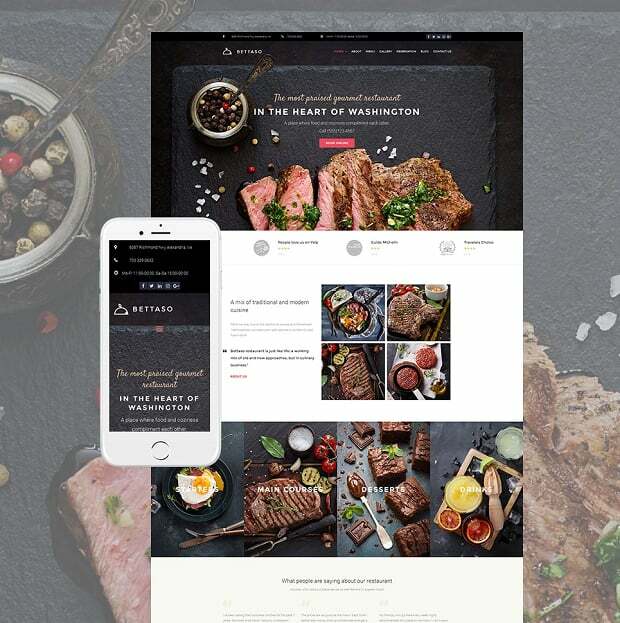 If you are just planning to create a website for your restaurant, do not forget that MotoCMS provides complete solutions for cafes and restaurants which are easily editable via the website builder with a user-friendly interface. Let us know your thoughts on this subject. 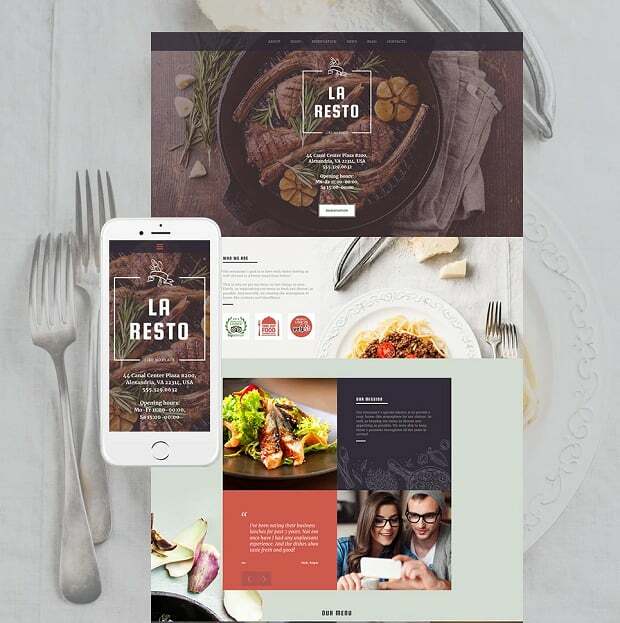 If you are a restaurant web designer, your experience will be especially useful for our readers.